This deciduous, spreading shrub is highly ornamental, with large, glossy, palmate leaves. It is best grown against a south or south-west facing wall, where, in long, hot summers it will produce an abundant crop of brown, pear-shaped fruit with red flesh. 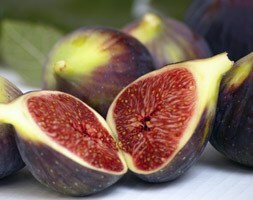 These figs are rich and sweet and available for picking from August to September. An interesting and easy plant to grow, and one of the oldest fruits in cultivation. Garden care: Plant in a 40cm (15in) pot in the ground or in a lined pit to restrict root-growth - unrestricted root growth leads to poor fruiting. Prune in spring when all chance of frost has past. Remove any frost-damaged or weak branches, and thin out shoots to let light in. Some pruning may be required in summer - trim all new shoots back to five or six leaves.